When film historians look back on the career of Jake Gyllenhaal, his portrayal of Lou Bloom will always be a role that is mentioned. He is nothing less than extraordinary in Nightcrawler. Like on the level of Robert De Niro in Taxi Driver kind of incredible. Now this is a bold pronouncement because as I write this, the movie has only been out three days, but I am confident in making this declaration. He’s that good. Director Dan Gilroy’s drama is surprisingly complex for a first time director. Heretofore he has been a writer (The Fall, Real Steel, The Bourne Legacy) but none of the aforementioned work could’ve prepared me for the flawless execution of his directorial debut. 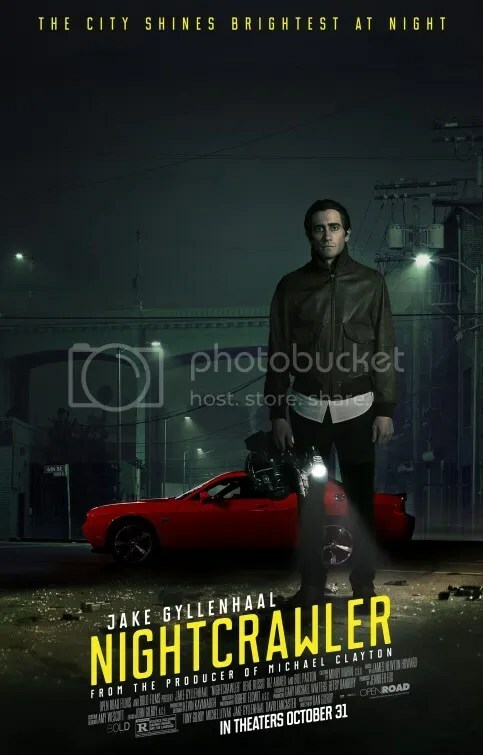 Based on the title and the release date, Nightcrawler sounds like a horror film about killer earthworms that come out at night to feed on human flesh. It’s funny because I didn’t realize how eerily close in spirit that description really was. Lou Bloom is a petty thief and a loser at the moment. But he’s a driven young man who knows how to take advantage of a situation. While out driving at night looking for opportunities to make money, he comes across some cops assisting people trapped in a flaming car on the side of the road. Also at the scene is Joe Loder (Bill Paxton) a man who videos violent incidents at night for profit – sort of an independent agent for local news programs that need footage. Lou gets an idea. With the money he receives from a stolen bike, he buys a camcorder and a police scanner. His latest scheme is born. The drama achieves so much in the span of 117 minutes. It’s a brilliant meditation on an individual who has always lived on the fringes of society. Jake Gyllenhaal is Oscar worthy as the small-time criminal desperate to make a quick buck with his videos of accidents, fires and other violence. But he is not the only fascinating individual. Riz Ahmed is Rick, a destitute man with no job experience who is hired as his assistant, although exploited is a more apt description. Rick’s story is exceptionally emotional for a mere side character. Things change when Lou meets Nina Romina (Rene Russo, the director’s wife) a TV news director. Russo is memorable in a welcome return to her juiciest part since The Thomas Crown Affair. Her career lives and dies by ratings. Violent crime in wealthy suburban areas is her preference and she makes no bones about it. She is a piece of work. In that capacity the script also serves as a scathing attack on sensationalized tabloid news journalism. First and foremost, Nightcrawler is a compelling character study. Jake Gyllenhaal manages to embody a thoroughly loathsome but intriguing character that you cannot look away from. He’s got nerve. He talks with a calm reserve even when he’s saying something rather disturbing. He’s creepy to make people uneasy and yet he’s driven by a plucky resourcefulness that‘s somewhat admirable. Although let‘s be clear, he’s insane. They should lock him up and throw away the key. The usually robust actor lost 30 lbs to appear more gaunt in the role. He also grew his hair out into an oily mane. Certainly the execution in his performance is his greatest achievement, but his appearance has the effect of physically transforming him into a completely different person. Perhaps Nightcrawler’s greatest accomplishment is to educate us in the ways of a sociopath. He makes us understand how that quiet, nice boy who was so polite, is capable of such evil. This entry was posted on November 3, 2014 at 9:12 pm and is filed under Crime, Drama, Thriller with tags 2014. You can follow any responses to this entry through the RSS 2.0 feed. You can leave a response, or trackback from your own site. I saw this last week and absolutely loved it. Gyllenhaal gives a career defining performance that put him in my top 10 movie psychopaths list. He’s been Oscar nominated once (form Brokeback Mountain) and I feel like this is an even better performance so I hope he at least is recognized. I saw this yesterday, and I couldn’t agree more with your assessment of Gyllenhaal’s performance. The mania lurks just under the surface of his character is perfectly pitched, the psychotic behaviour symptomatic of a society that has an ambivalent relationship with success (and the pursuit of it), greed and empathy. Even from the beginning when talking about rather mundane things like asking for a job, he still seems a bit off kilter. That uneasiness he creates becomes more and more pronounced as the story continues. Just as we who drive cars can’t pass a roadside accident without trying to look at it – Gyllenhaal’s Lou Bloom is the kind of film character that you watch and watch – and the more you watch, and the more you learn about him, the more repulsed you get. But we have to follow him down into those dark tunnels he goes into, those rabbit holes of human suffering that we know he needs to make his company profitable. No doubt we are made to feel so very uncomfortable as we watch – and yet – this film succeeds in being captivating. “…those rabbit holes of human suffering…” Oh that’s a great description. Great review Mark, thank you, keep them coming, i don’t have much too add because i basically liked the movie for the same reasons as yours. Always nice when we are in agreement. Wow. Not what I expected, at all! This was awesome! Jake performed at an Oscar worthy level. I can’t tell you how great this was. Intense, exciting, heartbreaking and powerful. Rene and Riz were also fantastic. 5 stars. I too was surprised by how good it was. “Nightcrawler sounds like a horror film about killer earthworms that come out at night to feed on human flesh. It’s funny because I didn’t realize how eerily close in spirit that description really was.” — this is brilliant. And wow, yeah how right you are. I am very pumped to see you are just as bowled over by Gyllenhaal as I was. I couldn’t believe how….effective he was. I’ll just put it that way. He was a soulless journalist, a consummate freak of the night hell bent on rising to the top. I absolutely loved the subject matter Gilroy used to make the statement he was making, too. What better career field to blur the lines of ethical and moral decisoj-making than a cutthroat industry like journalism. There’s still several major performances left to see [Steve Carell (Foxcatcher), Eddie Redmayne (The Theory of Everything), Benedict Cumberbatch (The Imitation Game)] However I really hope Gyllenhaal gets an Academy Award nomination for this role. It’s the best he’s ever been and he’s done some great work. Great review, Mark, and one I completely agree with. Tremendous film – challenging and fascinating, creepy and satirical. Gyllenhaal is masterful. I think I might be waiting for this one on Blu-ray at this point. Damn. Hope I don’t have to wait too long. Whether it’ll make your Top 10 is your choice, but any critic compiling a list should at least see it before the year is over. It’s a contender. Lovely review! Solid film although I think my expectations were a little too high. That shot of gyllenhaal when that guy was being carried into the ambulance was horrifying! Can you imagine what he was like as a child? I was really interested how he stirred the conversation away from where he grew up during that dinner scene. It’s interesting to think about his childhood. Definitely not someone who had a proper upbringing given how he turned out. I LOVE that you saw some of Taxi Driver in this film and performance as well. I agree, Gyllenhaal is really on another level here. Dude went all the way with Lou Bloom and delivered a great performance. Travis Bickle(ish), circa 2014. At this time, the movie has earned just a little over $25 million. I guess that’s not bad for a modestly budgeted indie. Still I wish more people saw this film. It might get a bump if it receives some Oscar nominations. It’s very dark, but so well acted. Nightcrawler was one I missed in theaters. I keep kicking myself because I’m constantly hearing about how amazing it is, and of course how incredible Jake Gyllenhaal’s performance is. I can’t wait to see it, whenever I get the chance. It helped that I knew nothing about it when I first saw it. Now it’s showing up on many many critics’ Top 10 lists for 2014. The hype might oversell it, but obviously I LOVED it. Jake Gyllenhaal’s performance was so controlled. It was a big disappointment he wasn’t nominated for Best Actor. Yet, I think Nightcrawler had a very disappointing climax. I loved everything about that film. My 4th favorite movie of 2014. But, don’t you think Nightcrawler could have ended 10 minutes before it actually ended ? I didn’t have a problem with it. Mark, you placed Nightcrawler 4th on your top 10 movies of 2014. The first three positions were held by Under The Skin, Snowpiercer and Boyhood and you had given each one of them a 5 star rating. So, how do you decide which one is better than the other ? I am facing a problem ranking The Theory Of Everything and The Imitation Game for my 2015 list. Would be very glad if you would help out. The Theory of Everything is better than The Imitation Game. Except than Nightcrawler, A Separation, Guardians of the Galaxy, Boyhood, Snowpiercer, Under The Skin, Toy Story 3, The Wizard Of Oz, The Shawshank Redemption, Titanic, The Fifth Element, One Flew Over The Cuckoo’s Nest, The Perks Of Being A Wallflower, The Princess Bride, Rear Window, Ghostbusters, Gone With The Wind, The Dark Knight, Captain Phillips, Moonrise Kingdom, Headhunters, The Artist and The Hurt Locker, have you given any other movie a 5 star rating ?